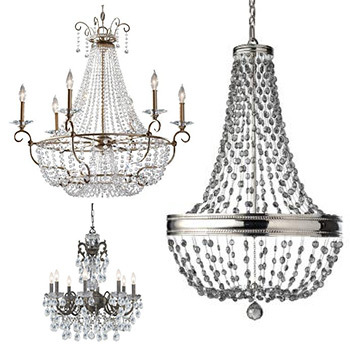 Crystal lighting, with its timeless beauty, will add glamour and style to any room. Hortons Home Lighting carries a wide range of crystal light fixtures, from contemporary crystal lighting and modern low voltage crystal chandeliers to traditional crystal lamps. Crystal light fixtures have a unique beauty that has to be seen to be truly appreciated, and that is why Hortons has devoted an entire section of our 20,000 square foot lighting showroom to display a wide range of crystal wall lights, crystal pendant lights, crystal chandeliers, crystal lamps, and more. Stop by one of our Chicagoland locations today to talk to our knowledgeable lighting experts, or you can view our online lighting gallery. Dining room chandeliers should be hung 30 to 36 inches above the height of your table, when you have a typical eight-foot ceiling. Add three inches to this for each foot over 10 feet.